When you’re embarking on a road trip, there’s a lot you can do to make the whole thing more pleasant and likely to go smooth. It’s not just a matter of having a gallon of coolant and quart of oil nestled away in the trunk with a reliable jack and spare tire - surprisingly, the tech you bring can make a big difference in the quality of the trip, too. Assuming your car is in good enough shape for the trip, you can go a few steps further to ensure the ride is safe and enjoyable, and to avoid unforeseen issues leaving your stranded on the side of the road or struggling find your way. Here are five tech-related tips you should keep in mind before you go bounding off on your next adventure. The last thing you want to do for hundreds or thousands of miles of driving is have your phone tucked away somewhere you can’t easily access for navigation. Not to mention, handling your phone while driving is also unsafe and unlawful. Fortunately, it’s easy to go hands-free these days. If you have a car that supports Apple CarPlay and a compatible iPhone, you should be good to go. Android users can similar get set with a Android Auto compatible car and phone. For everyone else, picking up a reliable phone holder should be high on the list of road trip purchases. 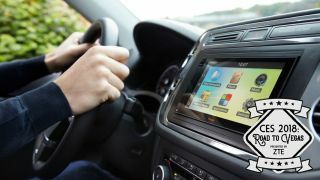 Android users can install the Android Auto app and make use of all the Android Auto functionality without any special connections to the car. iPhone uses will be a little more limited with their hands-free functionality while driving, but a dash mount will still make following the maps easier. Plenty of apps make driving more convenient and easier, which means that no matter your trip and your concerns, there’s probably an app that can help. If you’re worried about gas prices along the way, you can get an app like Gas Buddy that finds gas stations and lists their prices so you know where to score a good deal on your next fill-up. If you’re going to be parking in strange towns, using Waze for navigation can also save where you parked your car, so you won’t struggle finding your way back to your car. If the worry is finding parking along the trip and at your destination is the concern, an app like SpotHero or Google Maps can help you find a place to park, or Luxe can get you an on-demand Valet. Podcast, audiobook, and music apps are also a must-have, but you can take your pick of your favorites. Just don’t rely on your favorite local radio station having a reliable signal a few state lines over. If you’re on a really long haul, your phone and other devices might need a little more juice than they get each day while you’re sleeping. To keep everything charged, you’ll want to make sure you get a reliable car charger that will plug into your car’s socket. As tempting as it may be, don’t skimp out here, as a cheap one might not deliver enough power to keep your device topped up while in use. In one rare case, we’ve even seen a bad one give a phone such a jolt it couldn’t properly boot for a half hour ... which isn’t something you want in the middle of a trip. If you’ve got backseat passengers, you’ll want to make sure you’ve got long enough USB cables for them, or see if there’s another port they can charge from in the back. Bringing a power strip can also be handy when you make stops or reach your destination, as you can never be sure what competition for power outlets will be like. If you’ve never had a device crash or misbehave, consider yourself uniquely lucky. In the world of tech, things can go wrong in small and big ways with almost no warning. On a road trip, it helps to be prepared. For the most crucial things, it helps to have an entirely non-tech backup. Printing the route you’re following or having a series of atlases can be a lifesaver. On a long road trip, you can also expect your data service to spot out here and there. If you’re relying on that data for your navigation and entertainment, a dropped connection can turn a smooth trip into a slog. Downloading and storing everything you need on your phone can help. If you have space, download all the audiobooks, music and podcasts you want for your trip before you ever get in your car. With Google Maps, you can also download the map of certain locations ahead of time to save data or avoid getting lost if you lost your data connection. Nothing kills a road trip faster than a car that refuses to go. Dead batteries and flat tires are really simple problems but they can stand in the way just as easily as a blown head gasket or something worse. All that said, tech can help with some of the simpler problems and get you back on the road to your destination. One piece of super handy tech for any car owner is a large battery pack with a jumper cable attachment. This type of battery pack can really get you out of a pinch if you’ve accidentally let your battery die and there are no other cars around to give you a jump. Once you get to your destination, the battery pack can also help you keep your devices charged while you’re on the move. If you don’t have a spare tire or expect really rough roads, you could also pick up an electric tire pump. These are especially handy for long trips since you can just power the pumps with the outlets in your car. Barring extraordinary circumstances, these tips should help you enjoy a long road trip without having to worry too much about what could go wrong. TechRadar’s The Road to the Show 2018 sees our intrepid writers braving a cross-country trip across the US, using the best gadgets to bring you their daily travel blog and offering the best tips for a tech-based roadtrip. The trip is brought to you in association with ZTE and the ZTE Axon M, with car transportation provided by Genesis.